At GoGather, we’re big advocates for using strategic meeting management processes. We also believe it’s important to align business marketing and event management goals. That’s why I was delighted to read about recent research on these topics by the Global Business Travel Association (GBTA). The article, Marketing and SMM: The New Power Couple, by Alison Hall at MeetingsNet.com does a great job capturing the main points. Since its inception 12 years ago, we’ve been active supporters of the strategic meetings management (SMM) certification program. All of GoGather’s principals are SMMP certified. We’re also passionate about making marketing an integral part of event planning. It’s made a big difference in the return on investment we’ve delivered for our clients. Shared Focus – Approach every event with the end in mind. Everyone needs to be on the same page about what defines success, and how event content and activities support business goals. Our GoGather team reinforces those connections in our executive briefing documents. External Bridge Builders – Outsourcing event management responsibilities helps build bridges across political divides. When different agendas of event committee members surface, outside experts can serve as neutral advisors. Strategic Meetings Management Processes – They make the biggest impact when marketing goals are emphasized as much as cost savings, productivity and risk management. That’s true for internal conferences that align leadership teams, external trade shows to promote products and services, and incentive trips for inspiring key team members. Flexible Project Management Tracking Systems – They help meeting planners manage the entire event more efficiently. Having an online project timeline and budget, accessible 24/7 to all involved, also improves communications. Everyone knows what’s happening, who’s responsible and when assignments are due. Aligning marketing goals with SMM guidelines. You don’t have to eat the SMM elephant all at once. You can start with small bites to improve. 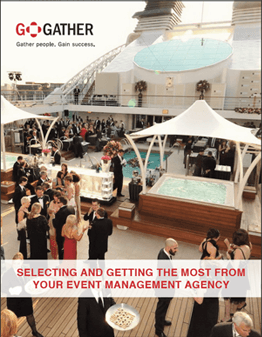 Outsourcing the work to events management experts also makes it all much easier to digest. Want to learn more? Check out the rest of our gogather.net site, download our event planning white paper or contact us at info@GoGather.net.